According to the Bangladesh authority both the arrestees belonged to Ansarullah Bangla Team, which was recently banned by the Dhaka based government for various terror activities. Niloy Neel, which was his pen name in alternate media, fell prey to the religious fanatics on 7 August 2015 at his Dhaka residential flat. An active member of Ganajagaran Mancha, a social organization, Niloy was hacked to death by machete-wielding killers in front of his wife Asha Moni. Bangladesh had earlier lost three bloggers namely Avijit Roy, Washiqur Rahman Babu and Ananta Bijoy Das in 2015, whose crime was to ‘question the radical Islamists’ in their blogs. The relatively small south Asian country with a population of over 160 million, which is India’s immediate eastern neighbor, emerged as a sovereign nation after a blood-soaked freedom struggle (Muktijuddha), where three million people lost their lives. It was finally born out of Pakistan in 1971 and its founding father Bangabandhu Sheikh Mujibur Rahman introduced their nation as a secular democracy. It is widely known that the present Sheikh Hasina led government in Dhaka has taken firm actions against the 1971 war criminals, but most of their fanatical supporters are still operating in the country with impunity. Two Jamaat-e-Islami leaders namely Abdul Qader Molla and Muhammad Kamaruzzaman were hanged already for their war time crimes against humanity and a few more are facing capital punishment. However, banned militant outfits like Ansarullah Bangla Team (ABT), Jamaatul Mujahideen Bangladesh (JMB), Hizb ut Tahrir, Harkatul Jihad Bangladesh, Shahadat e-Al-Hikma and Jagrata Muslim Janata of Bangladesh remain active in the Muslim dominated country. The steady rise of Islamic State of Iraq and Syria (ISIS) also continues to be a major security concern for the populous country. 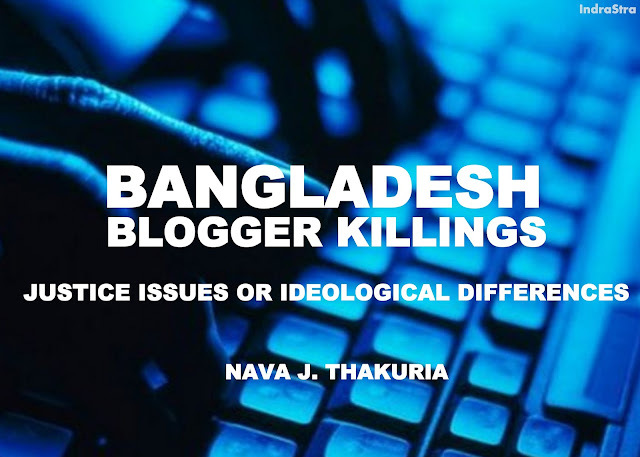 Besides many organizations across the globe, the United Nations also condemned the killing of Niloy calling upon the Bangladesh authorities to investigate and ‘bring to justice the killers of all previous slain bloggers’. The UN in an earlier statement expressed apprehension that there seemed to be growing intolerances towards people peacefully expressing their views on various issues’ around the world. “Freedom of thought, conscience and religion, as set out in Article 18 of the Universal Declaration of Human Rights, is the most basic right of all – the right to choose what to believe, to practice your beliefs, to share your beliefs with others in a non-coercive way, and to change your beliefs,” said a statement issued by Christian Solidarity Worldwide (CSW) adding that it protects the rights of people of all religions and the right to have no religion. And this is increasingly under threat throughout the world, asserted the CSW statement adding that it is in all our interests to ensure that governments, media and institutions around the world speak out for individuals in jail or facing execution, support civil society actors on the ground working to defend freedom of religion or belief, and make it a priority to promote this most basic of freedoms. Northeast India based media body Journalists’ Forum Assam (JFA) also expressed serious concern over the continued attacks on atheist bloggers in Bangladesh and urged the authority to ensure justice for the victim families. “The Awami League led government in Dhaka should show its sincerity in delivering justice for the victim families of slain bloggers at the earliest,” said a statement issued by JFA president Rupam Barua, adding that Ms Hasina, who is the daughter of Bangabandhu, must establish her credibility as a premier ensuring security to every Bangladeshi national who preaches for democracy and pluralism. Nava J. Thakuria Journalist based in Guwahati, Assam, India.